Anti-itch Soothing Shampoo from Barrier Animal Healthcare will cleanse, Soothe, De-itch, Calm and Deep Condition all in one application. This rich and gentle, anti-bacterial two in one shampoo and conditioner contains 100% natural ingredients of the highest quality. 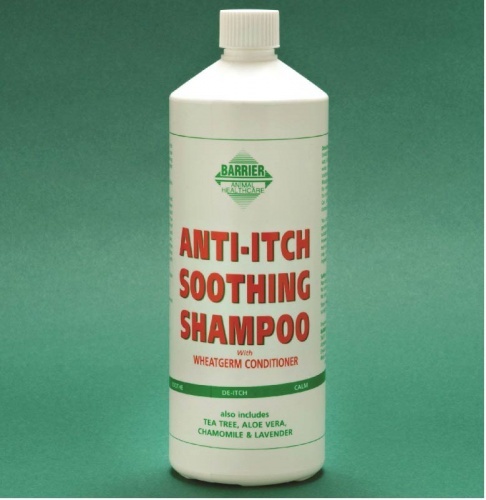 A perfect body wash for all year round use that will help to eliminate scurfy skin and maintain a healthy coat. Contains all the added benefits of Tea Tree, Aloe Vera, Chamomile and Lavender to gently soothe and calm, sore, bitten, irritated areas ensuring the skin is kept itch free and healthy, whilst cleaning away bacteria and fungi with ease. Apply diluted in water or direct to wet coat, for best results leave on the coat for awhile before rinsing. Can also be used as a non rinse wash using less product.